After the fine old buildings of Campden such as the Almshouses, St James Church, Grevel House and the Market Hall , it is perhaps unexpected to find an 18th century silk mill almost hidden away behind cottages in Sheep Street, just a hundred yards from the High Street. A silk mill in Campden? While it is surprising to find an three storey silk mill in a Cotswolds country town, as with other Gloucestershire textile mills around Stroud and the dozen mills in nearby Blockley, it was the presence of a source of water which attracted the builders of the mill. In Campden’s case it was the Cam running underneath the mill, which provided the original source of power. The mill is listed as Grade II* by English Heritage (now Historic England) as it retains many original features and is regarded as a nationally significant industrial building from the 18th and early 19th centuries. Certainly, its historic atmosphere is experienced as soon as you enter. The origins of the mill are uncertain and the first documented mention comes from a trade directory of 1780 which mentions “the recently erected mill in Campden which gives employment to great numbers of the poor in the town”. A close examination of the stonework of the walls of the mill indicates that a number of alterations were made over time. Throughout its life as part of the silk industry, the mill was a “throwing mill”. That is, it was involved in the spinning of silk thread and not silk weaving and the production of silk cloth. The raw silk is likely to have been brought to Campden from Coventry which was a major centre of both the spinning and weaving of silk. Raw silk was not produced in Campden despite the presence of a few mulberry trees. The silk industry went through periods of boom and decline throughout the 80 years or so or the active life of the mill. In 1834 a steam engine was installed to provide greater and more reliable power. About this time, an extension was added (to the right of the stream when viewed from Sheep Street). In 1851 when the mill seems to have been at its most busy, the census reveals that 15 women, 41 girls and two men were employed, but in 1860, after the signing of a new trade agreement with France, much of the silk industry in the country collapsed and the mill closed and was sold to a builder two years later. The mill was owned for the latter part of its life as a silk throwing mill by one of the families which lived and also owned two other mills in Blockley. 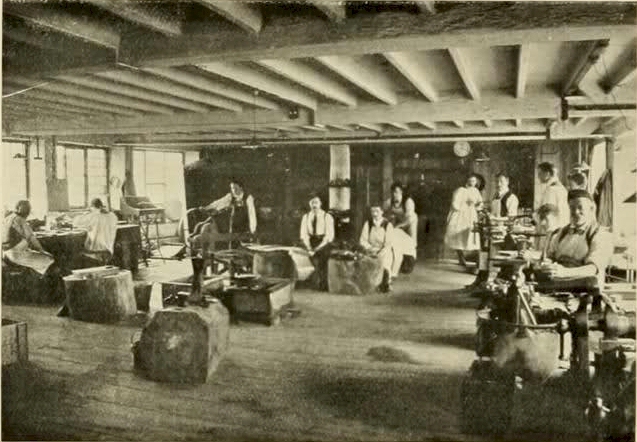 The mill had a new lease of life in 1902 when the Guild of Handicraft re-located to Campden from London, and became the centre of a creative burst of activity under the guidance of C R Ashbee. The Arts and Crafts movement focused on handmade objects, reacting against the rapidly growing dominance of machinery which resulted in the loss of craft skills. Hart’s silversmiths continue to work in their original workshop from the time of the Guild, still involving members of the family. They were joined in the 1960s by the design studios of Robert Welch on the top floor. The mill has played an important part in the life of the town for well over 200 years and continues to do so. Research on the Old Silk Mill continues and is currently focusing on the history of the building’s development and the people who worked at the mill and their place in Campden in the 19th century. This is steadily adding to our knowledge and understanding of the history of the mill and its place in Campden’s history.